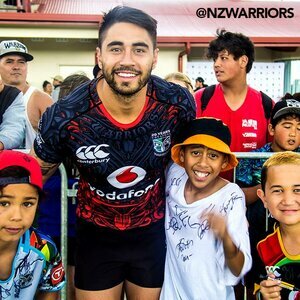 Available exclusively from the official online store at Mt Smart Stadium - our alternative training jersey is made in our core colours of black, red and grey. Original design inspired by combat sports clothing and incorporating stylistic tattoo graphics. 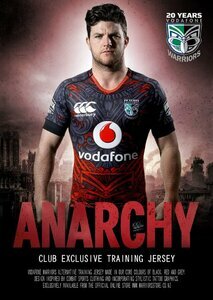 This garment is a replica of what our team will be wearing for training and at our trial game at Bruce Pulman Park on 21st February. Made from a strong mesh fabric that is specially designed to wick away sweat during tough games. 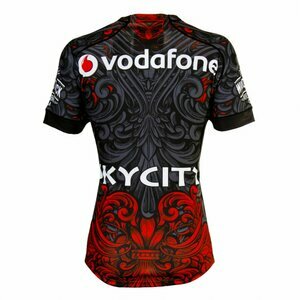 Features the CCC on the right chest and the 20 Years Vodafone Warriors logo on the left chest.